Ferdinand Ferber (8 Feb 1862 Lyon- 22 September 1909 Boulogne-sur-mere). was one of, if not the, most scientifically minded of the early French Aviators. In many ways, it was he who brought about the great blossoming of French Aviation after 1908. A French Artilleryman, he was one of the first Frenchmen to really begin to understand what the Wrights had produced, following their 1908 demonstrations in France. But that was not the beginning of his aviation. He had studied intensively the works of Lillienthal, and espoused a slow progressive scientific development of the airplane. He began working with gliders in 1899, and progressed them until 1901, without noticeable success. At that time he entered into correspondence with Chanute, and received copies of Wright's first Chicago lecture. He immediately abandoned the Lillienthal model and went to the Wright controllable model. He began building and testing Wright-type gliders in 1902. However, he did not include wing-warping, so the first Wright-type planes seen in Europe did not offer any control, and prejudiced European attitudes toward Wright fliers for years. 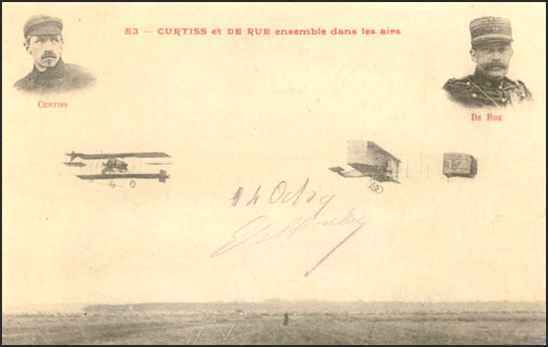 In 1904, Archdeacon supported the construction of a powered Wright type flier, which was flown without much success at Berck-sur-Mer by Ferber (along with Gabriel Voisin, interestingly). In late 1904, Ferber again tried to build a glider, but this time added more control devices, and tested his system in a tethered mode using a slide down a cable. His new glider more or less set the configuration for future European development of biplanes. In 1904 he made the first flight of a heavier than air machine in Europe when he took his mechanic for a short hop at Chalais Meudon. From 1904-1906, he collaborated with Colonel Charles Renard at Chalais-Meudon. In 1905, he built a larger glider to which he married a 12 hp motor, and on 25 May at Chalais -Meudon he launched it from an overhead cable and made a short powered glide. Although not really a successful airplane, it seems to rank as the first rationally conceived and constructed airplane to fly in Europe. He subsequently built two other machines, and made flights on them in 1908. In 1907 he left the Army and joined the Antoinette Company, where he was allowed to continue his experimentation and aircraft design. His greatest impact on the French aviation scene was not so much due to any particular aircraft, but to his continued emphasis on experimentation, followed by revision, followed by more experimentation. He continued to experiment when most of the others had given up. He introduced Chanute to the French aviation community, and influenced Archdeacon and Voisin. He earned his pilot's license (#5b) from the AeroClub of France on 7 January 1909, flying a Voisin. In early 1909, he undertook the task of organising an airfield at Juvisy/Porte-Aviation, and opened the second civilian school for pilot training. During the Rheims exhibition in 1909, he competed under the name of "De Rue". Following that, he won several minor competitions, also under the name of "De Rue". 22 September 1909 Captain Ferber was killed at Boulougne during a taxiing accident. ONLINE RESOURCES If you search for "Capt. Ferber +aviation", using the Google search engine, (4-5-04), you will find about 7 links. Among the most helpful are the following. The First International Aviation Meeting You will find a brief, but interesting note on Capt. Ferber on the Those Magnificent Men in their Flying Machines! website. You can access the page by clicking on the title above. If time permits, you will be well rewarded by reading this entire article and also should visit the homepage and sample some of the many fascinating stories which are available. Les dirigeables ZODIAC This page, one of two which are shown as links as a result of the Google search, offer information on the activities of Capt. Ferber and dirigibles. An English machine-translation is available directly from the Google page. It appears that Zodiac number 10 was named in his honor. You can access the first site by clicking on the title above. Transcribed by Bob Davis - 4-4-04 "Bolougne, Sept. 22. - Capt. 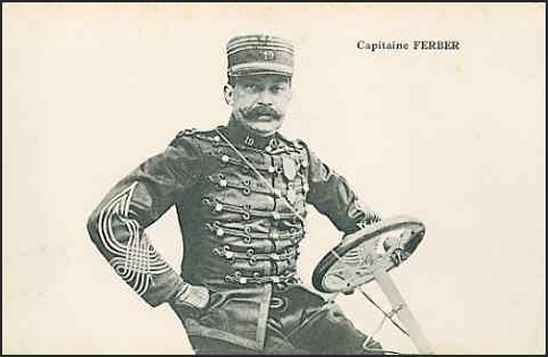 Ferber, an officer of the French army, was killed near here this morning while testing an aeroplane. While in the air the machine turned completely over and then dashed to the ground. Capt. Ferber was crushed to death by the motor. After a short flight the captain attempted to alight. A wing of the machine touched the ground and the aeroplane turned a somersault and crashed to the earth."